In his inaugural address on January 1, 2016, Mayor of Bogota Enrique Peñalosa outlined some ambitious goals. In line with the achievements of his first administration, Peñalosa declared his vision to make Bogota a world leader in sustainable mobility with the “best public transport system in the developing world” by 2020. Moreover, the mayor committed to double the modal share of bicycles, recognizing the efforts of former Mayor Gustavo Petro on the subject. Mayor Peñalosa has his work cut out for him. 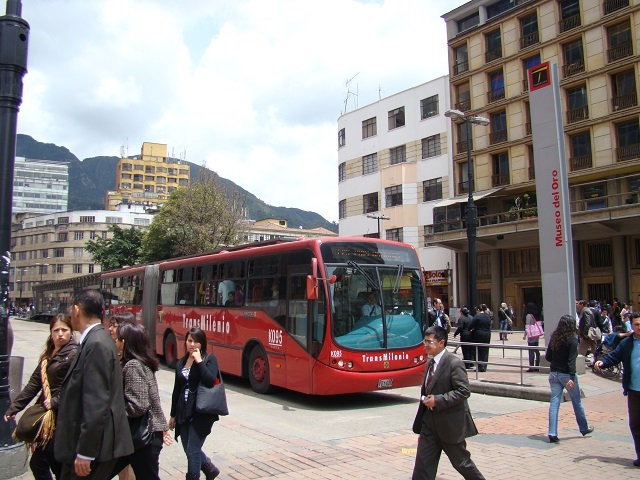 User satisfaction for TransMilenio and Integrated Public Transportation System SITP is low – sitting at 19 percent and 32 percent respectively according to Bogotá Como Vamos. Furthermore, the number of fare evaders exceeds 100 thousand people a day, and many riders complain about security, street vendors, packed buses, delayed feeders, damaged facilities and abuse. Alarmingly, the SITP deficit exceeds 600 billion pesos, and it’s clear that an increase in rates is inevitable yet insufficient. A technical team has spent years trying to improve TransMilenio, and there has been recent progress; for example, from 2014 to 2015 public perception increased from 2.88 to 3.25 out of 5.00 in surveys. To address additional concerns, there are two ongoing projects: (1) the construction of the Main Av Boyaca which faces funding issues; (2) the Aerial Cable Ciudad Bolivar, which is a transport feeder, and could majorly change transport in the city, as it has in Medellin. Also in progress is the Metro project, which is currently being reviewed for its high costs and risk, and will be completed with support of the Ministry of Finance and National Planning. The question remains: is it possible to enable Bogota to beat Santiago, the city with the best public transport in the developing world? It’s certainly possible. The heads of the city’s transformation are technically savvy people who are in love with the city and committed to its improvement, and Bogota has a solid foundation on which to begin moving forward. And while the portfolio of necessary changes is large, city planners know what must be done: integrate Transmilenio with the First Line Metro, recover and expand Caracas Avenue and the North Freeway (as it was originally planned in 2010) and strengthen the priority lanes of the public bus system. TransMilenio also needs operational reengineering, such as the simplification of routes, and new zonal services for SITP; one option is to change lengthy routes through an integrated scheme of neighborhood and urban services. All this should be accompanied with a renewed civic culture and additional policing. Special attention should also be paid to fleet replacement and the financial difficulties of the operators. The primary challenge is financing. A preliminary estimate indicates that Bogotá needs 40 to 60 billion Colombian pesos (USD 13-20 billion) to advance a broad portfolio of investments and to update the road network. Taking into account currently available resources, including a contribution from the national government for mass transport of 9.65 billion pesos (USD 3.22 billion), the government still needs between 20 and 30 billion pesos (~7.10 billion USD). The right path, according to tee mayor, is to acquire funds from the users of private vehicles. For example, the Mayor spoke of access fees for private vehicles, which has been rejected by the local council seven times. Another option is to draw upon real estate value. However, even with new sources of income for the projects, the city must recognize that the gap is large, and realizing these aspirations will call for participation from the private sector. Finally, the government must tackle credibility and responsibility throughout this process. This piece was originally published on TheCityFix Mexico and El Tiempo in Spanish.